Explore the Stop and Shop Circular, Weekly Ad Savings. Get this week Stop & Shop Flyer sale prices, grocery coupons, online specials and offers. Most Stop and Shop locations have a Pharmacy staffed with caring professionals. Stop and Shop Departments and Services: Bakery, Deli, Produce, Meat & Seafood, Pet, Nature’s Promise marketplace, Delicatessen, People’s United Bank at select Connecticut and New York locations, UPromise, Starbucks Coffee Shop, Citizens Bank at select Massachusetts and Rhode Island stores, RedBox – movie rentals, Coinstar, Western Union – Money Transfer Services. 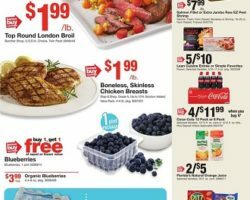 Save with Stop and Shop Circular & Flyer Sale Ad. My Stop & Shop Card offers: Weekly Card specials, Gas savings and rewards, Cash back for schools with A+, Checkout Coupons when you shop, Real Deal specials. Gas Rewards – Save 10¢ per gallon for every 100 points you earn. Earn 1 point for every dollar you spend with your Stop & Shop Card. Points are valid for 30 days. Stop and Shop own brands: CareOne, Companion, Guaranteed Value, Smart Living, etos, Nature’s Promise, Simply Enjoy, Always My Baby.